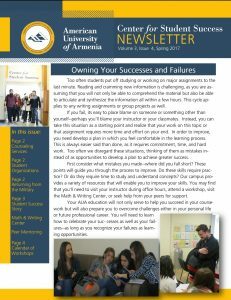 AUA is committed in supporting student development outside of the classroom through student activities. These clubs are recognized and approved by the Undergraduate Student Organization Advisory Council. Students are encouraged to become involved in various activities organized by student organizations. How to form an organization: All undergraduate students who are interested in starting a new organization must complete a Student Organization Charter Form available under the Student Organizations and submit this form along with the following documents: Organizations Constitution (see our constitution samples here Constitution Templates) and Club Membership list. The deadline for submissions is Monday, October 1st, 2:00pm. Where to submit a student club application: You may drop off your documents to Room 001N, Student Union, PAB or email them as attachments to studentsuccess@aua.am with a subject line “New Student Club Charter”. You can consult with the Coordinator of Student Services who will answer all your questions regarding student clubs and application procedure.